London’s Architecture Foundation has run a monthly programme of films at the Barbican for a few years now. They never fail to disappoint, and they attract a good crowd too. 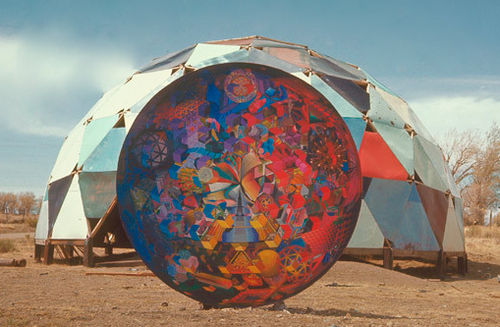 Next month is your chance to learn about this ‘geodesic dome ghost town’. Forget your gold rush ghost towns, this sounds way juicier – learn of the complex in-fighting, akin to that which befell the Biosphere II. Despite Alain de Botton’s argument in the Architecture of Happiness, sometimes we humans can never escape our self-imposed misery, despite fabulous surroundings. An exploration of the fabled Drop City – a short-lived countercultural settlement cited as the world’s first rural hippy commune. Founded in 1965 in Southern Colorado, the ‘Droppers’ created from, and subsisted on, society’s surplus through whimsical innovation and the drive to create a new civilization on the scrapheap of a wasteful society. So wrote Buckminster Fuller to the commune upon their winning of his inaugural Dymaxion Award. However, in the years that would follow, major media attention, in-fighting and a Summer of Love hippie onslaught soon caused the ‘city’ to become a geodesic ghost town. A treasure trove of archival footage and interviews with former residents reveal a fascinating picture of a now vanished prototype of experimental living. Barbican, Tues 9 July 2013 7.00pm £10.50 – booking in advance recommended. More information here.